It’s been a foodie few weeks over here at Ok, Let’s Do This. I am all warm-weather-inspired. And CSA is beginning next week, for real. And there is at least more daylight for picture taking. Repair happened yesterday! 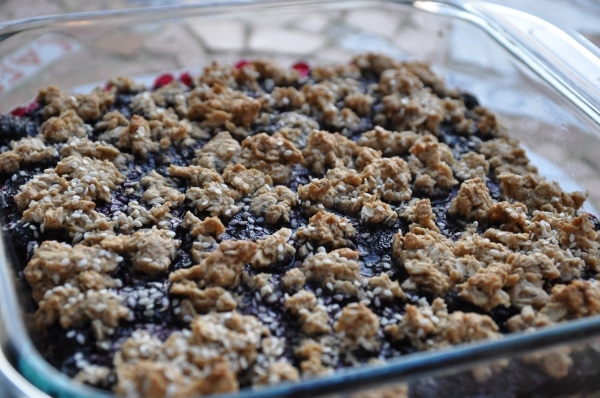 And of course I made these berry bars IMMEDIATELY. As in, as soon as I got home from work. However. It’s a balmy 60 degrees in the fridge. Called the landlord again. Someone is going to *try* and get to it today. In the meantime, most everything in there has gone bad. I can’t even express my annoyance. And yes, for those of you who recall, the oven and the fridge fizzled out in the exact same succession in this exact month last year. The upside? Take out for dinner! Back to the point. Anne and I love Oh She Glows’ recipes. We haven’t had a bad experience among us. She tried this before me and sent it my way with the highest of recommendations (her kids and husband all consumed it happily) and modifications (didn’t use Earth Balance, used butter but decreased the amount to 1/3 cup). Here’s what I have learned: if Anne likes it, I will too. So of course, I followed up. In a saucepan, heat the fruit over medium/low heat. When they start to soften, add sugar. Continue to simmer about 10 minutes. Fruit should be very soft and juice should start to thicken. Stir in chia seeds and turn off heat. While the fruit mixture is cooling, prepare the oat base and topping. In a stand mixer, add dry ingredients (minus sesame seeds) and mix to combine. Add liquids to dry mix and blend until integrated. In a greased pan (I used an 8×8″ Pyrex and a drop of coconut oil) Add 75% of the mixture and press into the pan. Top with all of the fruit jam (the chia seeds will have thickened it further). With remaining oat mixture, crumble over the top. Sprinkle with sesame seeds. Bake for 30 minutes. I think you’re supposed to wait and let it cool, but I cut into it about 5 minutes post oven and it didn’t fall apart. So I say if you have no patience, totally go for it. This entry was posted in Recipes and tagged cherries, oats, raspberries, recipes, strawberries by NicoleW. Bookmark the permalink.